Still reeling from the weekend’s sales? We don’t blame you. The Cyber Monday phenomenon, which in turn sparked the Black Friday weekend and later on, the pre-Black Friday sales week, is enough to satiate even the most avaricious shopper’s appetite. But stay tuned because the biggest event of the year is still ahead of us and not far from anyone’s mind – Christmas 2014. Besides the enormous amount of energy you will spend (or have already spent if you’ve used your weekend wisely) on purchasing presents for every last one of your beloveds, and the endless efforts that go into achieving that perfect Christmas picture which conveys just the right blend of warmth and nonchalance, the real treat is still around the corner. Eggnog! Just kidding. Family, carols, delicious food, presents, parties and for some lucky people – snow – what could be more fun? Inviting the gang over for your annual Christmas party? Get some free laughs by adding a Visual QR Code leading to hilarious Christmas specials on YouTube or simply make life easier for yourself by adding a RVSP QR Code or for your guests with a Waze QR Code. Using Visual QR Codes on invitations is always a hit as they can really help you organize your event and guests find them fun to scan. Wondering how to take advantage of the precious Christmas sale period but not sure how? Let a Visual QR Code campaign do the work for you! Create a large batch of Visual QR Codes, each of which leads to a different product in your online store and print them out to give to your customers. They can scan the QR Codes at home and instantly check-out the product of their choice into their shopping cart. Looking for a gimmick to spice up your store for Christmas? 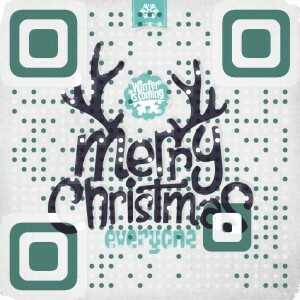 Purchase one of our lovely Animation QR Codes and use it to run a sweepstakes campaign. There’s nothing like an adorable blend of technology and animation to get your clients bustling around to scan your code.